Win the hearts of your close ones by sending this Unexpectedly Delicious Appetizer South Indian Lunch Basket and mesmerize them by your sweet gesture. Bring home all of the aromas and flavors of Dishes and see her face light up with a smile. 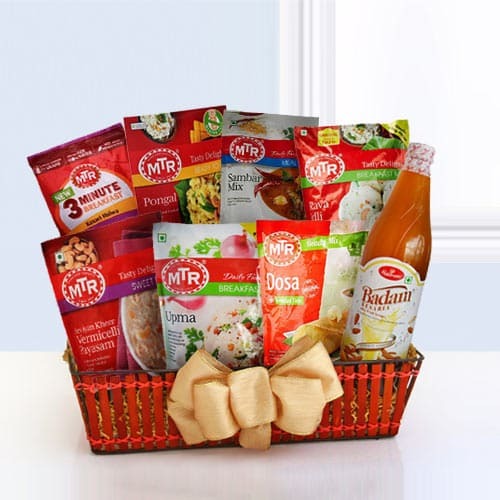 This Basket carries MTR Sambhar Rice Mix, MTR Pongal, MTR Upma Mix, MTR Kesar Suji Halwa, MTR Vermicelli Mix, Mix, Haldiram Badam Syrup, Mouth Freshener, Happy-dent Chewing Gum, MTR Idli Mix and MTR Dosa Mix.